Taiwan does not now nor has it ever officially used the Yale romanization system. But that hasn’t stopped the relatively common belief that the Yale romanization system for Mandarin can be found on some official signage here. What most people take as Yale is in fact MPS2, a Taiwan-devised romanization system that dates from the mid 1980s. MPS2 was developed Taiwan in a vain attempt to counter the growing popularity around the world of Hanyu Pinyin. In other words, it was basically the Tongyong Pinyin of the 1980s, though its supporters (there must have been some) never embraced it with the same level of nationalistic fervor as Tongyong Pinyin has received from some quarters. Little wonder, then, that most people — including many who really should know better — don’t seem to have noticed that MPS2 even exits, much less that a great deal of the island’s signage remains in this system. To some degree the confusion of MPS2 for Yale is understandable, given that the two systems have many points in common on which they differ with Hanyu Pinyin. Here are some examples. And neither uses Hanyu Pinyin’s abbreviated vowel forms (such as -ui for -uei, -iu for -iou, and -un for -uen). But here we can begin to see some of the differences between MPS2 and Yale. Yale often uses w as a medial where other systems would use u. 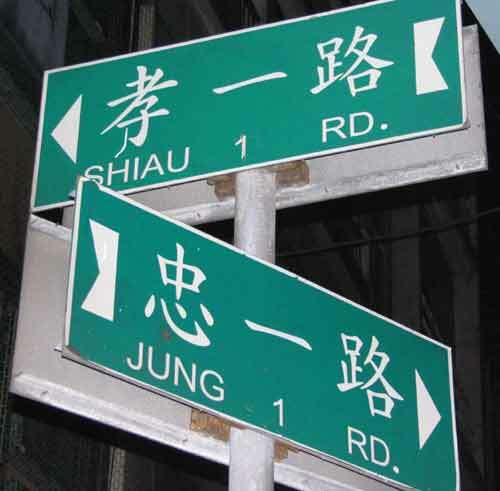 This sign, in Banqiao, would read Shrjyan in Yale, not Shrjian, which is MPS2. To review all of the similarities and differences among these and other systems, see my comparison chart of romanization systems. To close, here are some more signs in MPS2. What in Hanyu Pinyin is written zhong is jung in both MPS2 and Yale. What in Hanyu Pinyin is xiao, however, is written differently in MPS2 and Yale: shiau and syau, respectively. This photo was taken in Jilong. This entry was posted in Banqiao, Chinese, Mandarin, pinyin, romanization, signage, Taiwan, Tongyong, writing systems by Pinyin Info. Bookmark the permalink. One only needs to look at the rich, marvelous history of China to debunk this claim. The Chinese, are in fact, one of the most creative civilizations on the planet. They invented everything from gunpowder to the rudder to silk harvesting to acupuncture to the compass to iron casting to the blast furnace to the abacus to printing to ceramics, etc. etc. A walk down the street of any major modern day Asian metropolis, from Bangkok to Taipei to Tokyo will quickly dispel the idea that Asians “lack creativity.” In fact, a growing share of the world’s most cutting-edge, innovative technologies are emerging from Asia these days. (Just to give one example, the upcoming cutting-edge Boeing Dreamliner is in reality more a Japanese/Chinese product than an American one). To be sure, Americans do lead in the number of Nobel Prizes received. But this is highly misleading: Nobels are awarded for only one narrow range of science (fundamental science). Given that the U.S. government is by a million miles the biggest spender of fundamental science R&D, it shouldn’t be surprising that Americans lead in Nobel prizes. Asians have traditionally been more interested in science that has immediate practical applications. In any case, the Asians are closing the gap on science and already graduate far more scientists and engineers than the U.S. does (a troubling omen for America’s future). Last, but not least, most East Asian secondary schools leave their American counterparts in the dust these days. If you doubt Asians are a creative, innovative people, then spend some time browsing the latest cutting-edge products at your local consumer electronics store some time. All those plasma TVs and other high-tech goods are made in Asia (and, increasingly with Asian know-how). Incidentally, the old conventional wisdom that “it’s cheaper to manufacture in Asia” no longer applies these days. Japan, for example, is no low-wage nation (average Japanese wages are around 30 percent higher than U.S. wages, for example). However controversial Hannas’s complex second book might be, one thing it is most definitely not is racist. Your comments do not give me the impression that you have actually read the book. I encourage you to do so — carefully. sense and requires lots of pointless extra characters. again. No one would ever look at a written word and wonder how it was supposed to be pronounced. “Spelling Bee” contests would be a thing of the past. However, if we adopted such a system, I get the feeling that there would be a great outcry. Should the Chinese throw away their ancient writing system and adapt a Latin alphabet? Perhaps. But I think I understand why there’d be opposition in China to this idea. our bizarre, senseless, hard-to-figure-out, archaic system of measurements. Like I thought: You haven’t read the book and probably don’t know anything about this topic. You’re just recycling some second- or third-hand misinformation. Why you would want to waste your own and other people’s time doing so is beyond me. If you should ever become interested in learning something about this, there are plenty of good books listed in my recommended readings section. The best one to start with is The Chinese Language: Fact and Fantasy.